The following statement of support has been offered by Cindy Sheehan, a national leader of anti-war struggle in the United States ever since her son Casey Sheehan's life was cut short on the battlefields of Iraq. Cindy writes regularly and conducts audio interviews on her site Cindy Sheehan's Soapbox. As a resident of California, a one time vice presidential candidate on the Peace and Freedom Party ticket and a one time Gubernatorial candidate challenging Governor Brown – I pledge my solidarity to the September 9 multi-state work stoppage being organized as a non-violent protest against enslavement in the US prison system. The United States incarcerates its own people at a rate that is 4 times the rate as the rest of the countries on the planet. Yet whenever the US decides to start bombing another country – slaughtering civilians – it fraudulently invokes the word “freedom”. This word is devoid of all meaning when invoked by the elected officials that govern the US – the incarceration leader of the world. Accompanying every occupation is the construction of new prisons and the takeover of the existing ones and converting them to torture chambers – the likes of Abu Graib in Iraq and the facility at the Bagram air base in Afghanistan, not to mention the illegal detention facility in Guantanamo. The crimes against humanity that have occurred in these facilities – only some of which have come to the surface – belies any claim of bringing freedom to the counties the US bombs. So when the 13th. Amendment passed, it became illegal to breed the enslaved for the purposes of enslaving the offspring and to import kidnapped enslaved men and women and children from Africa. Instead it became necessary only to arrest and convict to replenish the supply of free labor – perhaps a less costly means of refreshing the supply of free labor providers. 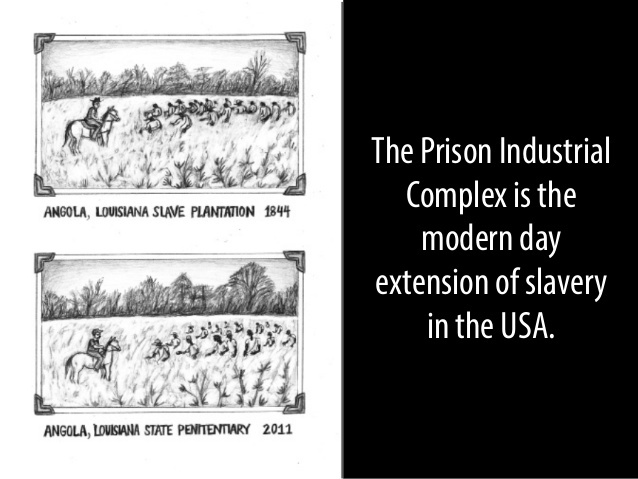 Throughout the history of the US, enslaved laborers have performed tasks, including those tasks needed to run the prison facilities: the performance of government functions (not just license plate manufacture) as well as contracting out to business and private industry. Today the arrangement is sophisticated with incarcerated enslaved laborers handling everything from making hamburger patties for McDonalds, boxing electronics for Microsoft, telemarketing for Verizon and many, many other tasks for private industry and government. California itself has been for decades under court order to reduce the prison rolls due to the inhumane treatment of its incarcerated men and women because of prison overcrowding. Governor Brown continues to fight against the court mandates – his latest scheme is to create a boondoggle of hoops prisoners will have to go through to get released. At one point in its arguments against mandated release, the Brown Administration actually complained of possible financial hardship to the state should it have to hire fire fighters instead of using enslaved prisoners in that role to control the rampant forest fires in the state. Now there is word that brave men and women who are incarcerated and enslaved in the United States from states like Alabama and Mississippi and several other states are calling for a national work stoppage on September 9. That date is of particular significance since it is the 45th. Anniversary of the Attica State prison uprising that led to a massacre of 39 prisoners and guards at that facility – a massacre that was ordered by New York Governor Rockefeller. What the prisoner leaders are organizing is a non-violent work stoppage – as they put it they are ending their own enslavement by refusing to work as enslaved. Meanwhile on the outside, in New Jersey and Alabama and other places around the country, advocates of justice, decarcerators, prison reform advocates and prison abolitionists are organizing activities in solidarity with the work stoppage. In NJ, the organizations Decarcerate the Garden State and Peoples Organization for Progress are supporting the demands of the prisoners to end the enslavement of the incarcerated and at the same time pressing other demands like freedom for all political prisoners, a 50% reduction in the state’s prison population and improved conditions in NJ facilities. The ‘outside’ solidarity should be a model for similar actions across the country – here in California we can demand compliance with the court ordered reduction in the prison rolls once and for all. I declare my support for the September 9 non-violent work stoppage of the prisoners and urge Inside – Outside unity and encourage people to support the efforts of Decarcerate the Garden State, People’s Organization for Progress and other advocacy groups that are organizing solidarity events on the outside as well as groups like Free Alabama Movement that are organizing the work stoppage on the inside. Let September 9 be the beginning of a new era where we build unity with our incarcerated brothers, sisters and children and send a clear message to the politicians of both political parties. The politicians want everyone to believe that they are against mass incarceration – but somehow year after year refuse to address the issue in any significant way. September 9th will also prove to be a timely date to raise these issues – so close to the nation’s presidential election. A resounding set of actions across the country on that date would send a message that we are not allowing important issues to be drowned out by the media obsession with campaigns. When sending more people to prison is good for profit, it's bad for justice. I have never been in jail. Or prison. Or even questioned by the authorities, or under surveillance, under suspicion, arrested, indicted, prosecuted or persecuted. Neither have about 300 million other Americans. The fact remains that most people in prison or jail are there due to their inability to function within the societal constraints of this country. Recidivism at 90% indicates that the majority of criminals aren't very bright, and those that are intelligent don't give a rat's patoot about you, your property or your life. I can safely assert that the great majority of people in prison have done everything possible to get there on their own lack of merit.